You’ve probably read somewhere recently that robots are coming to take your job. It’s true, they probably are. But they’ve got some growing up to do first, says Rob Nail, CEO and associate founder of Singularity University. Nail knows robots. He ran his own automation and robotics firm, Velocity11, before it was acquired by Agilent. And while things have moved ahead since then, one robotics rule hasn’t changed—the hard things are still easy, and the easy things are hard. Schaft robot, winner of the DRC trials, opens a door. Speaking at Singularity University’s Summit Europe, Nail showed participants select footage from last December’s DARPA Robotics Challenge trials. Even he, a robotics fan, admits it’s terribly boring. The bots perform tasks most of us do without thinking—opening a door, turning a valve, climbing stairs. They bumble through each mission at such an agonizingly slow pace, playback has to be sped up to make it bearable. There are many fails. And this is the cutting edge. Nail drew an analogy to his young son, who is just now learning to open doors, climb stairs, navigate debris—and disturbingly, put the car into gear. But he’s a little slow, clunky, and likewise fails often. Today’s most advanced robots are still toddlers. But Nail doesn’t expect that to last long. A few underlying drivers are pushing their development forward. Sensors are cheap, pervasive, and embeddable. Using sensors to measure motion, orientation, and location and cameras to see their immediate surroundings, robots can balance, navigate, and differentiate and manipulate objects. Further, it’s getting easier to program them to do all these things. Not long ago, it took advanced degrees and experience writing machine code to program robots. Now a kid at home or in the classroom can do it. As these trends reduce barriers to entry and cost, more people are developing robots—and increasingly, more people can afford to buy them. And there’s one more thing that’s fueling robotics: investment. 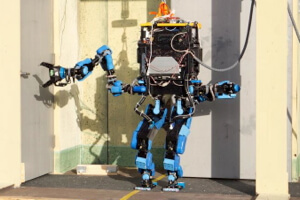 Google bought eight robotics firms last year, including robotics leader Boston Dynamics. Softbank acquired Aldebaran. Why? These firms foresee a future rife with robots. Nail spoke with an Aldebaran Nao robot next to him. As if to illustrate his point, the Nao wouldn’t cooperate at first. Nail jumped offstage to grab his laptop and reboot the bot (it fell asleep—twice, in fact). “Don’t mind the man behind the screen,” he said, working to get it up and running again while soldiering on with his presentation. When Nail finally did get the Nao to work, however, it proved remarkably fluid in its movement—a tai chi routine—and speech. Not long ago, a similar (probably less functional) robot would have cost tens of thousands of dollars and been confined to a lab. Now it runs $8,000 and is available to well-heeled enthusiasts and even marginally funded researchers. 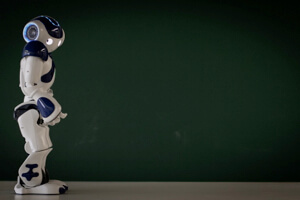 Nao is a personal robot, but most robots still live in factories. 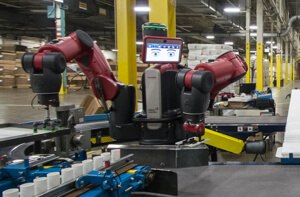 Whereas, their tasks have traditionally been dirty, dull, and dangerous—the most advanced industrial robots are now able to do work with greater accuracy, speed, and consistency. Factory bots aren’t fully autonomous, but Baxter, a robot by Rethink Robotics, illustrates how much more flexible they’re becoming. Instead of being programmed to perform a single highly specialized task in carefully controlled circumstances, Baxter can be guided through any task once—and precisely repeat it a million times thereafter. Robots are also finding their way beyond the factory. Nail said he attended a function using a Beam telepresence robot—and couldn’t have been more popular had he been there in person. He chatted with the late Robin Williams (who joked he looked a little skinny), talked to former San Francisco mayor Gavin Newsom, and posed for pictures with a pair of curious ladies. 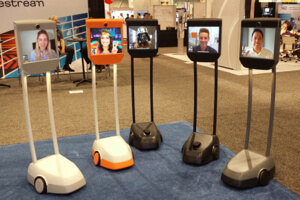 Telepresence robots aren’t just for parties. They can be used in the office to beam in remote workers for meetings—an improvement on traditional teleconferencing. Meanwhile, at home, the most common robots are still vacuum cleaners. Dyson’s upcoming 360 Eye will compete with iRobot’s Roomba. But Nail notes, we shouldn’t forever view these as one-use systems—they may evolve into platforms, like smartphones, on which developers can make apps for myriad other tasks. Firms are already developing personal companion robots. Most of us have been fond of a movie robot, and as it turns out, our attachment to C3P0, R2D2, and WALL-E isn’t confined to films and fiction. Nail said an iRobot survey found 40% of Roomba owners named their bot in the first year—and 30% admitted to taking it on vacation. While these robots won’t exhibit emotions soon, they’ll likely adapt to our emotions using cameras, microphones, and programs that can detect emotional cues by voice and face recognition. Nail mostly dedicated his talk to service robots, but he didn’t neglect that other robot meme—killer machines. He said even as drones are finding use beyond the military, we’re still giving them weapons and sending them into combat. Giving robots weapons is a bad idea, he said. There are many non-violent applications, and it’s a shame that military applications cast such a long shadow. Indeed, along with privacy concerns, negative associations may make it harder to find regulatory support for private applications, like drone delivery, in developed countries like the US. Still, Nail doesn’t think the robot revolution will slow down. And come next June, he says the robots competing in the DARPA Robotics Challenge finals will be much improved at their tasks—showing just how fast they’re growing up.